I had just gotten off the phone with our guitarist Bryon Brown and I was still reeling a bit. Our last bassist Dustin had had to quit due to financial reasons a few days ago, and now Bryon had to make some decisions to continue with school and couldn’t put in the time for a quality band any more. By mid-afternoon, I had talked to both Bryon and Chris Farmer — the three of us were the original “Inviolate 1.0” members — and they both gave me their blessing to continue the band and use the name as I saw fit. (Chris, earlier that year, had moved up to New Jersey to be with his wife and had transitioned from being our bassist to a manager role). And Inviolate had a show on December 17 — the biggest one to date yet: opening for Epica and Scar Symmetry at the Masquerade. I’d never played the Heaven stage before, and I WANTED to do that show. Badly. And I was nowhere even remotely close to giving up on music. To get my mind off things for awhile, that night I continued with my plans to go to Dragon*Con with some friends that year. In the Utilikilts booth, I found my friend Alan Strange, who plays guitar for Prime Mover, and let him know what was going on. Right there he told me “If you need a guitarist to fill in for a few shows, give me the music, I’ll help you out where I can.” I’d known Alan for years in Atlanta’s metal scene, he’s a great guitarist and supporter of local music, and was really heartened by his offer. Later that night I saw FiXT artist Celldweller‘s show for the first time — a first I’d been looking forward to for years. As I watched Klayton and Bret (of Blue Stahli) play and jump interchangeably from instrument to instrument, the grain of an idea started in my head — could Inviolate, especially with its blend of metal and electronic elements, work in the same capacity? Here were two guys playing *every* instrument, switching up as needed. The seed was planted in my mind that very night. Later that month, I hit up my buddy WuD, who was at the time playing for SidAerial and a church band. I knew he was no stranger to playing with a click or in-ears (an absolutely necessary skill for playing Inviolate’s songs), and he had started putting himself out on the market as a session player. Lastly I approached Brandon DuBose, a bassist who had already filled in on a few shows for Inviolate after Chris left and Dustin stepped in. Then I collected all the tabs, studio, and scratch tracks I for every song that would make up the setlist, and spent a month bouncing demos, instrument isos, and practice tracks for all three instrumentalists so they’d have as much as I could think of to make pickup of songs as smooth as possible. The four of us started getting together in November after Alan, WuD and Brandon had learned their parts and BAM. The first Inviolate 2.0 lineup was constructed. After a small show in Greenville as a warmup, the four of us opened that 12/17 Epica show at The Masquerade to the biggest crowd Inviolate had ever had to date. And for the first time I really felt like Inviolate had a viable way to continue. Inviolate began getting more shows out of state, about once a month. Slowly I began approaching members of Atlanta’s rock and metal scene to help me out with these shows. Sometimes they would approach me and volunteer to help me out with a show. I began working with Brandon, WuD, and Alan a bit more, and began rotating in others when one of them couldn’t do a show for whatever reason. Then in the spring, Inviolate started recording the Feast of Ashes album with Bryon and Chris laying down what they wrote on guitar and bass, and the kickass Mike Froedge took care of the drum parts (and co-production). By the end of 2011, I had about 7 musicians on speed-dial (including Robert Hannon on bass and Jeremy Kidd on drums — what the hell is “speed-dial,” anyway? ;)) whom I would hit up whenever a show date became available. Somehow, this revolving door of musicians thing was working…… and many of them wanted to come back and do more. This is when Inviolate started using the moniker “Inviolate 2.0” more heavily, distinguishing the original permanent (“1.0”) member lineup from this new, revolving-musicians arrangement. Instead of pretending it wasn’t happening, why not make it a “thing”? Our thing, or one of the things Inviolate would be known for. Inviolate spent the first half of the year really concentrating on making the Condemned video (which features Alan, Brandon, and special appearance by drummer Monte Shane) and finishing, then releasing the Feast album. At our CD release show at the Masquerade, Inviolate featured 9 of us (Alan, WuD, Brandon, Robert, Mike, Bryon, Chris, Ryan Beitz (drummer for Prime Mover, who also did backup vocals on the Feast album) and me — all onstage at the same time for “Endgame”, the final song of the night. Inviolate started playing a lot more shows in the southeast to push the album, and expanded the roster to include Shiloh Bloodworth (drums), Drew Collum (guitar) and Jarrod Johnson (guitar). Even more shows, and the first non-Atlanta 2.0 musician worked with us — Brian Ellis from Greenville SC stepped in to play guitar at a show in Orlando. We would play the mid-Atlantic and New England for the first time. 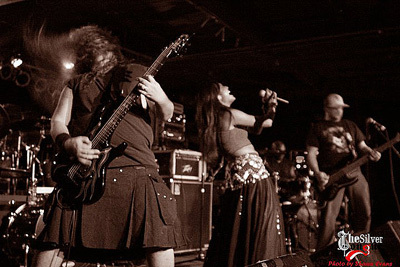 And Inviolate would also be nominated for the GA Music Awards as a contender in the Metal Band category. (I always amused myself imagining the looks on everyone’s faces if a cadre of 11 musicians came up to receive the award more than actually winning the award itself). We’d welcome Derek Obscura (guitar), Clifton Bishop (bass) — both from Atlanta’s The Casket Creatures — and Shon Harp (bass). Also this year Chris and his wife moved back to Georgia, and all of us enjoyed a closer working relationship having our manager in the same town as us. In the fall of 2014 we’ve added South Carolina guitarist Travis Dry and Orlando, FL drummer Don Cadman (formerly of Florida’s Nu Era and Dharmata) to the ranks, cementing the fact that one does not have to live in Atlanta to be an Inviolate 2.0 member.